Oooh Very nice! Is it a 338i sedan?? I came to visit your blog because I was wondering if you posted anything about the Clubman launch in the US. Just curious to see how the demand is looking for Clubmans down there. I have yet to update my blog.. I've been crazy busy with exams!! 4 exams this week and 2 papers so next week I should have an update or two or three! you could call it... "Cracka"
The Fast and Fabulous Sprint Booster is now available for most Drive-by-Wire modern enthusiast cars and the MINI Cooper and all BMW's are at the top of the list! 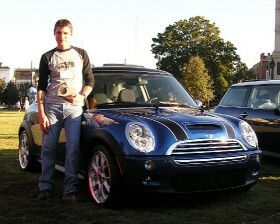 www.SprintBoosterSales.com is the source for the ultimate in Plug and Play Performance for the MINI Cooper and MINI Cooper "S" from 2001 to 2008 models.